I love the show "Take Home Chef" and while not exactly the same situation, I am now happy to report that I have a take home sommelier. Recently back in contact with an old friend, Ryan Schwartz, who happens to be a sommelier and wine distributor, we joined efforts. Every month or so, I'll write recipes that are challenging to pair wines with (for me), and he'll teach me the nuances of wine pairings and introduce me to the perfect wine for the recipe. Best of all, the wines are easy to find and affordable in case someone else wants to try it. After all, this is a home cooking blog. Here is how Ryan walked me through the decision on the pairing - my first wine lesson! •The first goal is to match weight – is the food heavy or light, and then match the wine to that. This recipe is medium weight, so we want a medium weight wine. •Next is compatibility – like flavors with like flavors. This recipe is tricky because of the spice. Spicy food and spicy wine (like a Zinfandel, etc.) equals more spice in the mouth. Not good. But a wine that can’t stand up to the spice just would get overwhelmed (like white wines). •The fish in the recipe demands acid (that crisp taste in white wines and a few red wines), but the spice and the rest of the recipe wants some body with tannins (that puckery feeling in the mouth). •Soooo, we need a red wine that has acid and tannins. This narrows the field. Nebbiolo has enough acid and tannins, but it has TOO much tannin. Barbera would work; this would be a good second choice. Pinot Noir would be too soft and not be able to stand up to the spice. Tempranillo would be a good choice, but since the dish is Italian, why not be authentic and match it up with an Italian wine? •This helps us arrive at the perfect wine: Chianto Classico. A wine with acid, tannins and can stand up to the spicy sauce without overwhelming the fish. •Chianti had a bad name for years because the restrictions on what exact percentage of grapes could be used was so stringent it forced winemakers to not make the best possible blends. Thus, they started making superior wines but unable to call them Chianti – called them Super Tuscans. Restrictions have been softened of late, so once again Chianti is regarded as excellent wine. 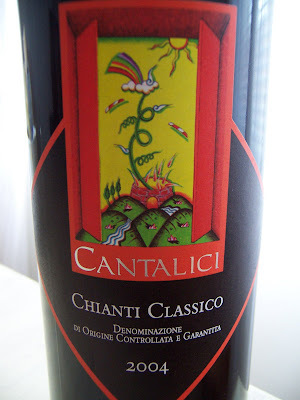 •The wine chosen is Cantalici Chianti Classsico 2004. 85% Sangiovese, 10% Merlot and 5% Cabernet Sauvignon, tasting notes say it has a great ruby color, inviting aromas of currants and blackberries with a great balance on the palate. I just thought it was delicious and was perfect with the pasta. Ryan obviously knows his stuff. •Where to buy? It’s imported by Vias Wines and sold in many stores throughout the US. In Arizona, it’s at AJ’s, and if they don’t have it in stock, they can get it within a day. Retail should be about $20. Next, cook pasta to al dente, drain and reserve about 1/2 c cooking liquid. Meanwhile saute garlic, shallots and red pepper flakes in olive oil, careful to not burn garlic. Add wine and bring to a boil, reduce by about half...add tomatoes, simmer, adding salt and pepper as needed (to taste). Add squid to tomato sauce, along with drained pasta and reserved cooking liquid. Simmer, tossing frequently, and turn off heat before mixture nears dry (wayyy before seafood becomes at all tough). Garnish with crushed red peppers and chopped parsley, serve immediately. I want a take home sommelier(goes and pouts). What a lovely post. Thanks for sharing your wine lesson with us. 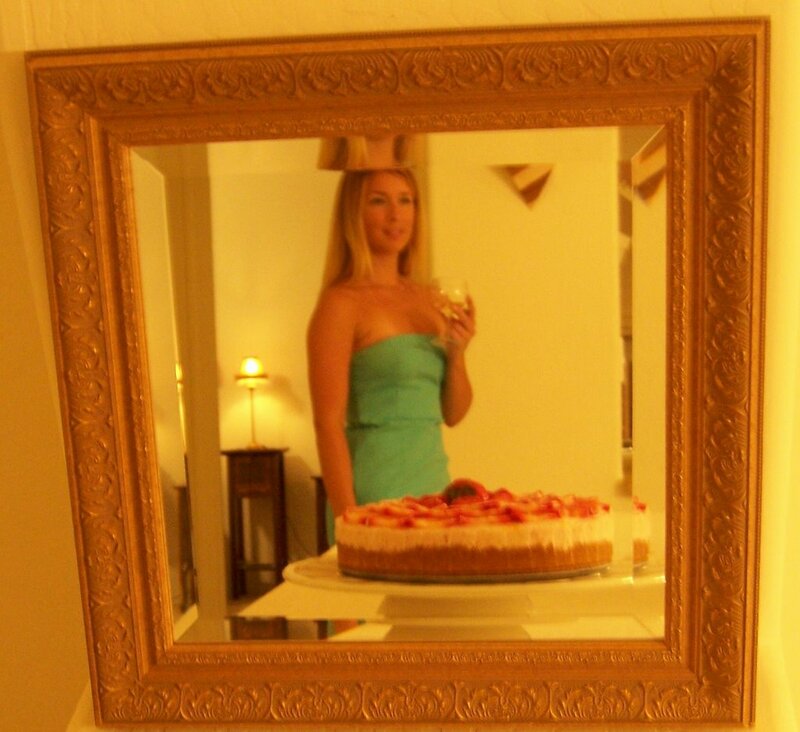 Your recipe and wine pairing look fantastic! Did you get the squid at Ranch Market? What a wonderful idea - I'm so excited to get to learn more about wine and how to pair it with foods along with you. 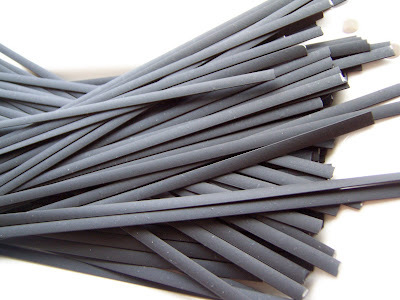 And the pasta looks delicious! I took a wine tasting course and since then I appreciate the different varieties so much more. I even drink white wine now. (I used to only drink red). That's such a dramatic presentation, I'd love it! 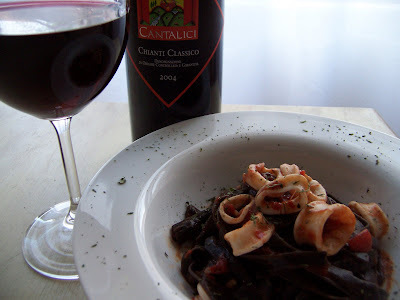 The squid ink pasta, seafood, fra diavolo heat...a great combo and I'll look for your wine suggestion! I'm glad because I recently found out they're airing the show here in Brazil, too. I've watched 3 episodes and liked it a lot! Thank you Maureen - email me: re the Thai and Sprouts meet up! Hi Joel - I got the squid at Lee Lee's - good quality. Thanks Christine, Nora, Kelly-Jane and Peter! What an educational lecture on wine! Useful and practical! 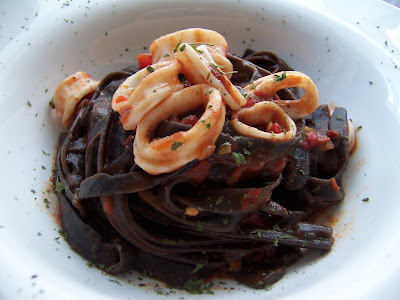 Pasta con Frutti DI Mare con Salsa Fra Diavolo?? hmmm just by reading this title , it made my mouth water, I need to eat that rigth away!